Live Green, Wear Black. 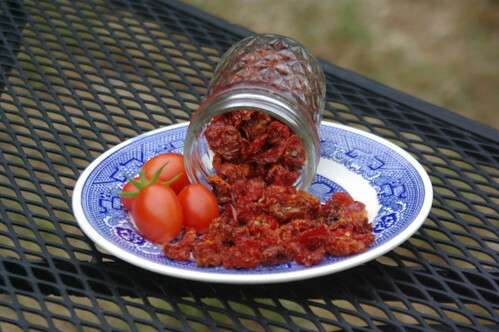 : Dried Tomatoes! The Principe Borgheses turn into little tomato raisins - pretty, and tasty. I don't like this dehydrator because it dries things unevenly. Some tomatoes looked burned on the edges, others got a bit moldy and didn't look like they were drying at all. James borrowed a 5-tray Excalibur dryer from his friends for Asian pears and the results are amazing: dry, soft and chewable, super sweet Asian pear slices. It's still too foggy and cold to consider using the solar dehydrator. Beginning to think that it is a Bad Idea.